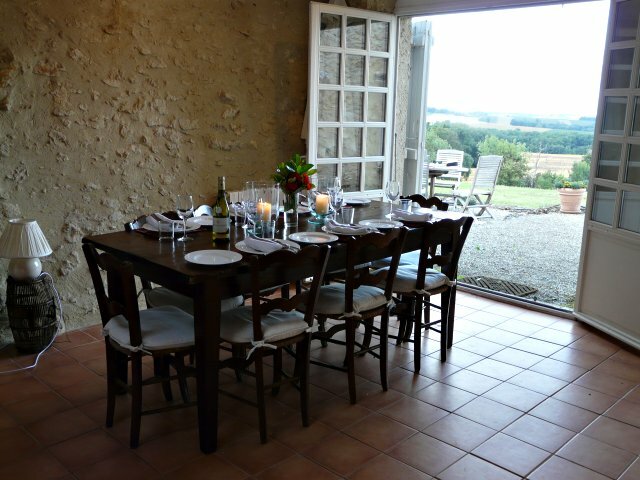 Au Chicot has many lovely character features: high ceilings, truly wonderful beams, some beautiful exposed stone and solid wood floors, plus loads of light and space. A rare feature of the property is that almost all windows have extensive views. The interior has been furnished in a deliberately understated way, using a careful blend of French country antique and quality contemporary pieces. Walls are white, sofas cream, colour accents being introduced by means of rugs, pretty quilts, cushions and prints. In summer, shutters, ceiling fans and thick walls will keep you cool, while sealed unit double glazing, modern electric wall mounted radiators, plus two wood-burning stoves will ensure cosiness on an early Spring or late Autumn break. Although doorways are not wide enough for wheelchairs, Au Chicot is suitable for those with limited but fairly independent mobility: the ground floor is level except for a single shallow step from the kitchen/breakfast room to the salon/dining room and another leading from the hall to the downstairs twin bedroom with wet room. With two bedrooms on the ground floor enjoying en suite facilities, and a further two bedrooms and bathrooms on the second floor, the house is perfect for two families sharing. Au Chicot also caters for babies and we offer a mini blender, sturdy highchair, plastic tableware, plus a good quality wooden cot with bedding and a baby bath. There are some throws for the sofas too. A welcoming space and formerly the kitchen, it has a fireplace with an old bread oven and Jotul wood burning stove, antique farmhouse table, mirror plus original quaint staircase to the pretty first floor landing; this in turn leads to two delightful bedrooms (one en-suite) and family bathroom. Off the hall, in a corridor leading to the main bedroom, is a separate downstairs WC. Built-in wardrobes in all rooms, with plenty of shelves and hanging space. 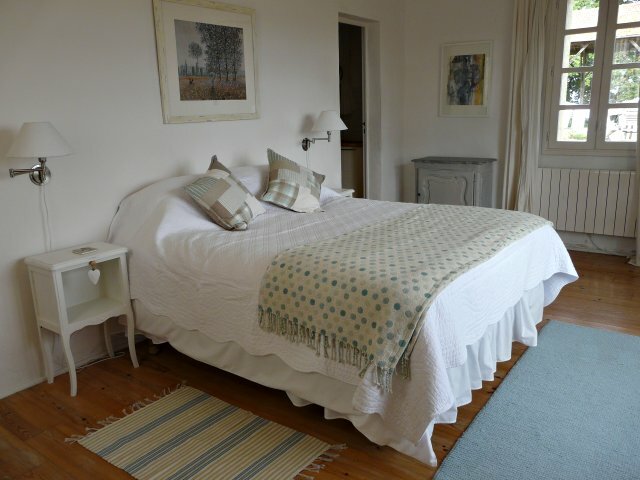 Bedrooms 1 and 2 (ground and first floor) have triple aspect/panoramic views and roomy double beds (160cms). Bedroom 1 also has French doors opening directly onto the outstanding views. 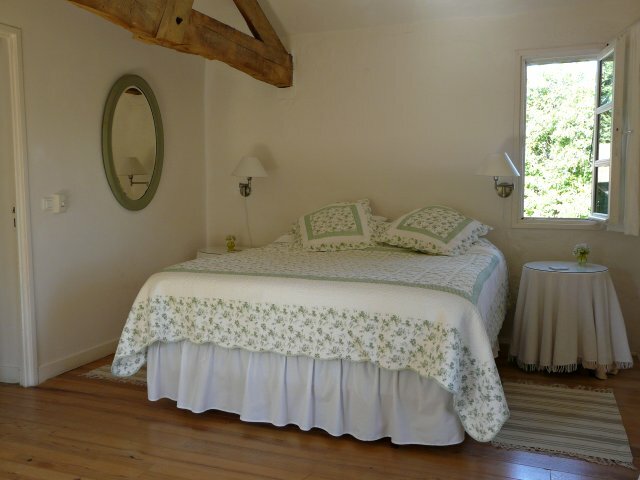 Bedrooms 3and 4 (ground and first floor) are twin rooms but beds can be joined to create a 'Super King' bed (180cm); these have pretty views to the little orchard and vines. Both second floor rooms have high ceilings and beautiful beams. Four in total. Bedrooms 1, 2 and 3 each have an en suite 'wet room" with shower, basin and WC. Simple, but modern and functional. The family bathroom is on the first floor, and has a bath with shower over, basin and WC. Heated towel rails in all. Separate downstairs cloakroom with WC and basin. Exposed stone, high ceiling and lovely beams; tiled floor. 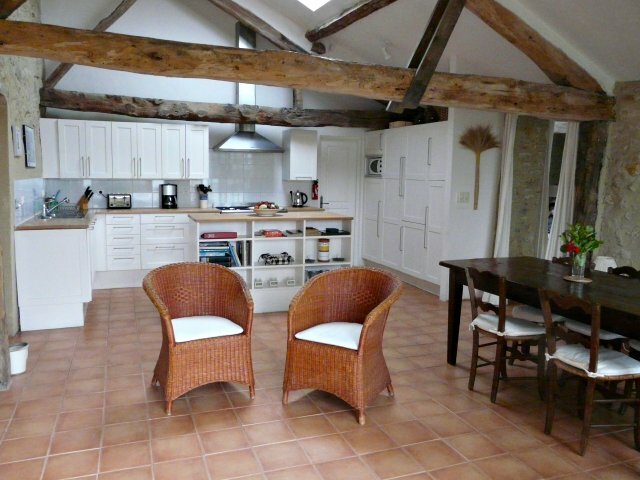 A very light room, it has solid woodwork surfaces and hand-painted units with a central island. Looking out to the views, there's a good looking dark teak Lombok table and 6 chairs, plus a pair of rattan armchairs near which is a medium size satellite TV, (large TV in the salon) CD/DVD player, and Wi-Fi box.. Double French doors open on to the terrace. Large Smeg oven/gas hob, full-size fridge-freezer, as well as microwave, dishwasher, kettle, toaster, filter coffee maker, cafeti�re, plus all the gadgetry you're ever likely to need. Shelves with a variety of cookbooks for inspiration. There's a cool-box for your days out too. Directly off the kitchen, this houses the washing machine, tumble dryer, a large second fridge, iron, ironing board, vacuum cleaner, other cleaning equipment, containers for recycling and shelves. 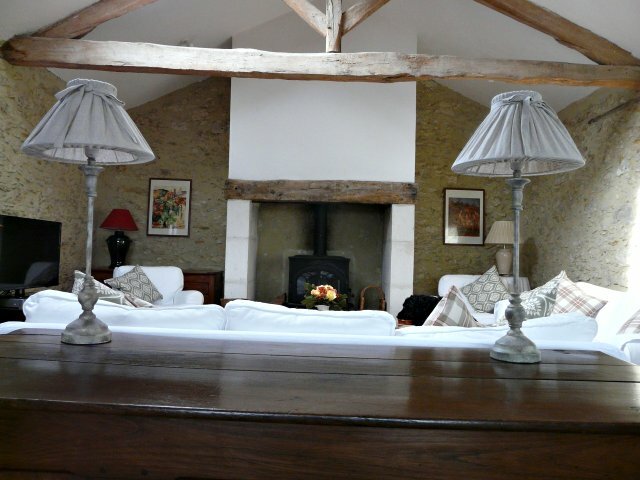 Again, with high ceilings and beautiful beams, this lovely room opens onto the terrace. There's an elegant table seating 10 and the wall is lined with books including guides and maps, plus masses of videos, DVDs, and CDs to please all tastes. A wonderful old "maie" bread chest divides the room into two areas. 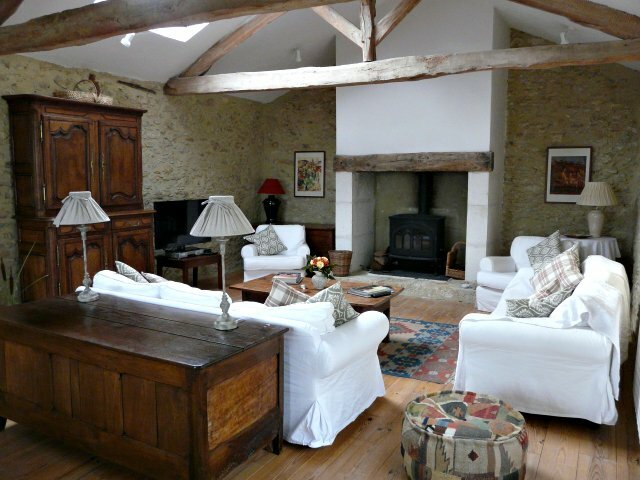 On the other side, two sofas and armchairs for 8 are grouped around the coffee table and Jotul wood burning stove. There is an LG 42" flat-screen TV for enjoying English and French channels together with a CD/DD player. An iPod docking station is also supplied, and for more holiday options you'll find lots of games and jigsaws in the large old oak "homme debout" tallboy. Every effort has been made to keep the continuity in the style and decor of the house over time and in the 'Gallery' section which links to Flickr.com photosets you will see how the interior decor has remained consistent with that of the house under its previous ownership. Au Chicot combines simple country charm with home-from-home comfort. For more precise details of what is included in the rental rate, please check the Booking page.